A NASA mission has discovered an important process explaining the fate of energy contained in the turbulent magnetic fields surrounding the Earth. The phenomenon, discovered by NASA’s four-spacecraft Magnetospheric Multiscale (MMS) mission, is small but provides crucial insight into turbulent plasmas. The Earth’s magnetic field protects us from the solar wind, which is a stream of plasma coming from the Sun. Plasmas – streams of charged particles such as protons and electrons – fill much of the visible universe, so studying their properties can tell us a lot about space environments. Intense periods of solar wind also cause ‘magnetic storms’ on Earth that disrupt GPS satellites and ground communications, making understanding its dynamics important. The solar wind plasma becomes very turbulent where it interacts with the edges of the Earth’s magnetic field, in the ‘magnetosheath’. Turbulent plasmas are not well understood in physics, despite playing a fundamental role in environments, ranging from lab experiments to the Sun. 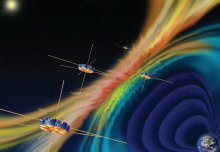 Now, researchers studying data from NASA’s Magnetospheric Multiscale (MMS) mission at the edge of the Earth’s magnetic field have discovered the ultimate fate of this turbulent energy and motion. The results of the team, which includes Imperial College London researcher Dr Jonathan Eastwood, are published today in Nature. Where are the ion jets? 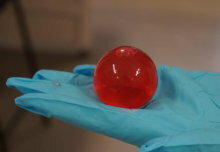 The answer revolves around a phenomenon known as magnetic reconnection, where energy from the magnetic field is transferred to the particles, creating hot jets of plasma. This dissipates the energy of the turbulence. Magnetic reconnection is seen on large scales, and was predicted at smaller scales where it would dissipate energy as heat. However, very small-scale magnetic reconnection has never been observed until now, and several alternative mechanisms were also proposed to be the cause of the dissipation of turbulence. The team analysed MMS data in the turbulent region and found reconnection occurring on the scale of electrons, the smallest scale observed to date. However, they found a key surprising difference in the process at this small scale compared to larger scales. At larger scales, magnetic reconnection produces a ‘jet’ of charged particles called ions. This occurs for example in the Earth’s magnetic field on the ‘night side’ of the Earth, facing away from the Sun, as part of the process that creates the Northern and Southern Lights. However, at the smallest scales, no ions jets have been observed. Instead, the team determined that reconnection only affected the electrons in the plasma and created electron jets, which are very much faster than ion jets in large-scale reconnection. Dr Eastwood, from the Department of Physics at Imperial, said: “Turbulence is one of the last great concepts in classical physics that we do not understand well, but we know it’s important in space as it redistributes energy. The discovery confirms reconnection is happening on these small scales rather than some other process. However, the discovery also opens up many new questions, such as why the ions are not involved and whether this same process occurs in other plasmas. New theories and models now need to be developed to understand magnetic reconnection at these small scales. 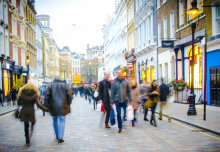 This work has been supported by the UK’s Science and Technology Facilities Council. 'Electron Magnetic Reconnection Without Ion Coupling in Earth’s Turbulent Magnetosheath’ by T. D. Phan et al. is published in Nature. Second video: NASA Goddard/Mary Pat Hrybyk-Keith; NASA Goddard’s Conceptual Image Lab/Josh Masters. 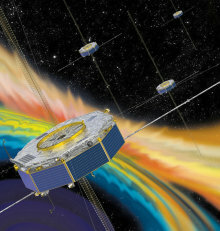 The MMS mission is a fleet of four spacecraft that orbit the Earth together studying the magnetic field and the solar wind. Usually, with one spacecraft, measuring these small and fast phenomena is difficult, as the spacecraft has to rotate between measurements. With four spacecraft working in concert, the team were able to take measurements up to every 7.5 milliseconds. This allowed them to map electrons and ions in 3D, tracing their movement and showing reconnection in action.